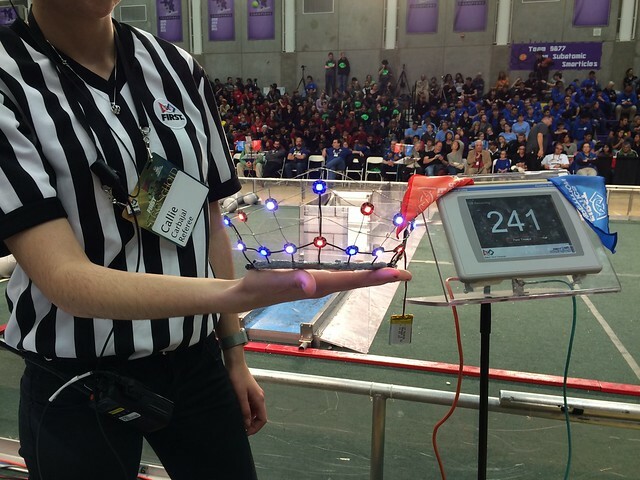 Last year while attending FIRST robotics competitions with the Firebots, I had the privilege of serving as a judge at both the Central Valley Regional and the Sacramento Regional. Judging gives an opportunity to get to know the folks involved in the competition, whether they’re students, mentors, or other volunteers like you. I’ve judged and volunteered at a few events now, and one of the great things to see is the way that the community builds and nurtures itself. One of the students I met in past years, Callie, had graduated from her team, but keeps coming back as a volunteer. 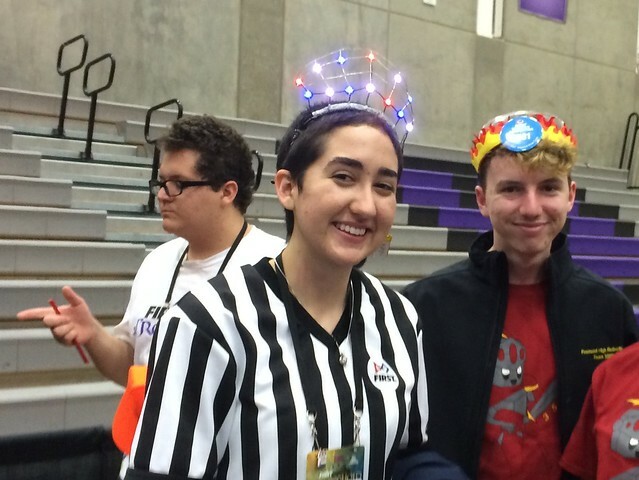 Callie was refereeing at both events, and shines brightly as a role model. Literally. 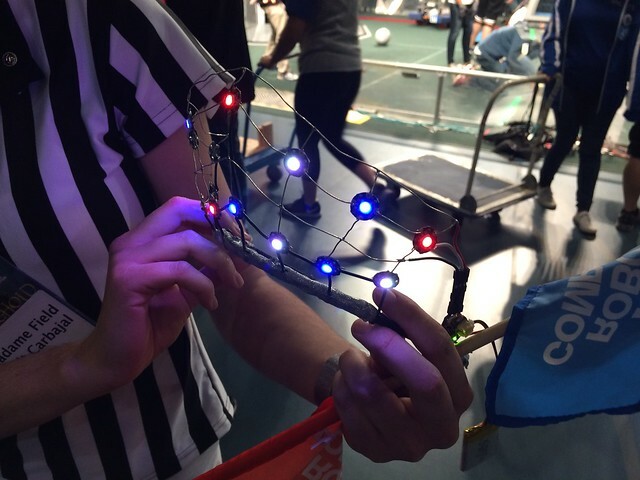 She built an LED tiara and programmed it to light in the event colors of red, white, and blue. She let me take a few pictures of it. It is made with Adafruit Flora Neopixels, a Gemma controller and a small LiPo battery. 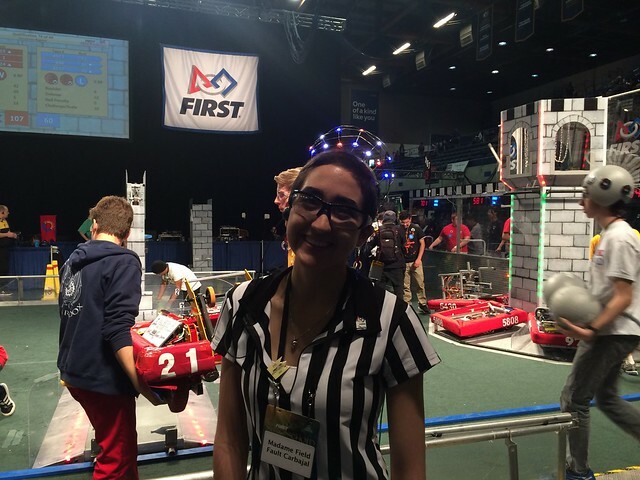 She’s a student at UC Davis, and is a truly wonderful role model for the high school students at the events. While you don’t necessarily need an LED tiara to shine as a role model, Adafruit does have a tutorial so that you can make one, too. This entry was posted in Electronics, Engineering, Microcontrollers, Robotics. Bookmark the Permalink.